Many fast Fourier transform (FFT) algorithms implement an intermediate transpose stage. 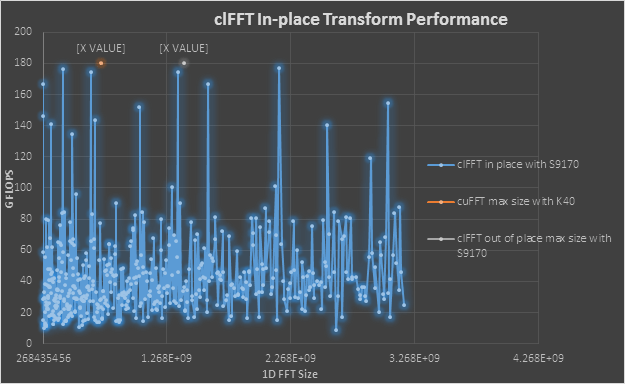 Traditionally, the transpositions have used an out-of-place approach in the clFFT library – that is, the library allocates a temporary buffer to store the transposed result. Recent efforts sought to eliminate this temporary buffer by employing in-place transpose [1, 2]. I am excited to share that we have extended the in-place transpose from a 1:2 dimensional ratio to any mix of radix-2, radix-3 and radix-5 ratios. The extension increases the vector sizes that clFFT supports without allocating a temporary buffer, moving from strictly powers of twos to any mix of radix of 2, 3 and 5. For example, in the range from 2 GB to the max single allocation size on a FirePro S9170 card of 25,502,069,760 byte, the number of supported sizes for a single-precision complex-to-complex FFT expands from 4 to 500. Moreover, the maximum size increased from 2,147,483,648 (or 16 GB of single precision complex elements) to 3,185,049,600 (or 25,480,396,800 byte of single precision complex elements). The largest possible 1D FFT size is therefore very close to the largest single-allocation limit, using nearly 75% of total device memory. The graph below depicts the 1D FFT performance using the in-place transpose on the FirePro S9170 card with driver version 15.302 . The white dot denotes the maximum 1D FFT that clFFT supports without using in-place transpose on the same system. The orange dot indicates the maximum 1D FFT I was able to run with cuFFT on a K40-based system . To maximize global memory utilization with clFFT, make sure the environment variable CLFFT_REQUEST_LIB_NOMEMALLOC is set to 1. Since the algorithm with in-place transpose is slower than the one with out-of-place transpose, users should decide whether memory utilization is more important than speed. They should also ensure that the buffer size exceeds neither the system memory size nor the GPU’s maximum memory allocation size. I’m unsure whether any other GPU-based FFT library can guarantee that it entirely avoid temporary buffer allocation (please leave a comment below if you know of one). The cuFFT user guide , for example, does state the need for a temporary internal buffer. When running a 6GB 1D FFT test using cuFFT on a K40-based system with 12 GB of global memory , cufftPlanMany() returns error code 2 ( CUFFT_ALLOC_FAILED ). To summarize, clFFT may have just introduced a distinguishing feature that cuFFT lacks, applying an FFT computation to a buffer that is almost as large as a GPU device can allocate. Thangaraj, Santanu. “Calculating Large FFTs in Memory-Constrained Systems”. N.P., 2016. Natarajan, Bragadeesh. “Computing Very Large FFTs on AMD GPUs”. N.P., 2016. Timmy Liu is a Software Development Engineer at AMD. Links to third party sites, and references to third party trademarks, are provided for convenience and illustrative purposes only. Unless explicitly stated, AMD is not responsible for the contents of such links, and no third party endorsement of AMD or any of its products is implied. In vulkan runtime libraries there are no pop-up windows shows as a notification for users to notify their reputation when installing the Vulkan Runtime Libraries on a computer system. Vulkan Runtime library is designed by NVIDIA or AMD display card makers. Vulkan also has new graphics standards similar to OpenGL and DirectX.